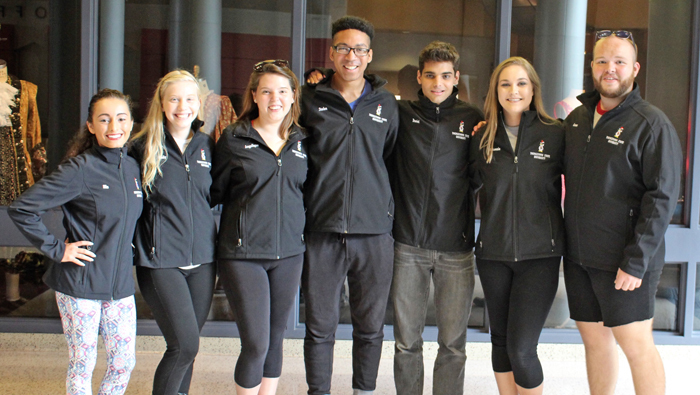 Students and alumni in Youngstown State University’s Musical Theater program travelling to Oslo, Norway for a conference include, from the left, Mia Colon, Emily Shipley, Angelique Tanner, Stefon Funderburke, Daniel Navabi, Makenzie Moorman and Connor Bezeredi. Five students in the Musical Theater program at Youngstown State University are in Oslo, Norway, with a select group of other students from throughout the world to participate in the Musical Theatre Educators’ Alliance Conference. The students are Daniel Navabi, sophomore, Columbus, Ohio; Stefon Funderburke, junior, Farrell, Pa.; Mia Colon, sophomore, Youngstown; Angelique Tanner, junior, Waverly, Ohio; and Makenzie Moorman, sophomore, Piketon, Ohio. Two recent YSU alumni, Emily Shipley, Struthers, Ohio, and Connor Bezeredi, Salem, Ohio, will also participate. YSU students competed for positions through an audition process, and were awarded five of the 18 open slots. Other students participating are from Singapore, Italy, Denmark, Norway and Australia, with only two additional U.S. schools represented – Shenandoah University and Florida Southern College. Upon arrival, the students will rehearse for three days, and then perform a showcase for audiences and international casting directors. Students will perform both solo and group pieces in musical theater as well as featured dance pieces. In addition, they will attend a variety of master classes and rehearsals. Musical Theater faculty member Nancy Wolfgang will accompanies the group and teach a masterclass. The Musical Theatre Educators’ Alliance International was founded in 1999 as a means for teachers of young professional artists to come together and exchange ideas, methodologies, and solutions to common challenges in the academic settings of universities and conservatories. The organization has grown to worldwide status with member institutions spanning across the United States, Europe, Asia and Australia.